I think I like these more than the pops. They look really impressive. 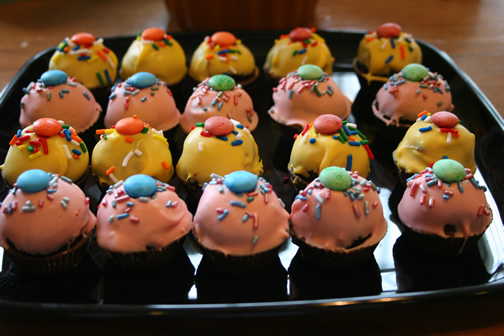 Just like the Cupcake Pops recipe, be sure to go to the Bakerella site to see pictures on how to make these. 3. Roll mixture into quarter size balls (make sure they are smaller in diameter than that of your candy mold) and lay on wax paper covered cookie sheet. 4. Chill in the freezer for a few minutes, until they are slightly firm, not frozen. 5. Melt chocolate bark and candy melts in microwave per directions on package. 6. Using a spoon or squeeze bottle, fill each mold cavity with a small amount of chocolate. But as soon as you fill the cavity, go ahead and place one of your rolled balls into it. Carefully push it down until the force causes the chocolate to push up and fill in around the sides of the ball. You may have to experiment with a couple to get the right amount. Stop pushing once the chocolate reaches the top edge. 7. Place the mold tray filled with cupcakes in the freezer for just a few minutes to let the chocolate set. Remove and then gently pull up on the cake ball top to release from candy mold. 8. Now, holding the bottom of the cupcake, dip the top in another color of melted chocolate. 10. And, probably impress your friends and family. Makes about 50. Store in an airtight container and they will last for several days.